Happy New Year. As I promised in the last post, I have the Blue Shoes and Happiness scarf pattern ready. I re-knit the scarf ( I first designed and made it in the Spring of 2006) so I could remember how it went. This second version is slightly different from the first. Named after the book by Alexander McCall Smith. See December 31 post for details. finished size: (before blocking) 8.5 x 54 inches with approximately 2 inch fringe. materials: 400 yards Noro Cash Iroha in dark blue (color #7) (mc) ; a few yards in green (color #105) (cc); more for a longer scarf. note 1: Each of my skeins yielded 123 yards (a European packaging). I used three and ran short on the fringe. The scarf also could have been longer. note 2: Cash Iroha is a worsted weight blend of 40% silk, 30% lamb's wool, 20% cashmere, and 10% nylon. It is a luxurious yarn (see previous post), but the scarf would be equally fine, if not better, in a plain worsted weight wool such as Cascade 220, Patons Classic Merino, or Brown Sheep Lamb's Pride Worsted. I would try the latter if I knit this again for a thicker scarf. needles: I used US #9/5.5 mm straight needles. Needles can be short length. #9 circular needle for picking up stitches along the edge of the scarf. Rows 1 and 7: knit (k) across. Rows 2 and 8: purl (p) across. Rows 3 and 5: *k1, p4, k1; repeat from asterisk. Rows 4 and 6: *p1, k4, p1; repeat. Rows 9 and 11: *p2, k2, p2; repeat. Rows 10 and 12: *k2, p2, k2; repeat. gauge: I got close to 5 stitches and 5 rows to the inch (actually 4.8 of each) in the basket pattern stitch. Of course gauge is not crucial here. With mc, loosely cast on 32 stitches. On every row - slip 1st stitch purlwise; knit last stitch (this will be important in picking up stitches later for edging). Work 6 rows of garter stitch; attach cc and work 2 rows of garter stitch; re-attach mc and work 2 rows garter stitch. After final repeat of basket stitch work 2 rows garter stitch, attach cc and work 2 rows garter stitch, re-attach mc and work 6 rows garter stitch. 1) The slipped stitch edge forms a chain along the entire length of the scarf. Using cc and circular needle, insert the needle through both strands of the chain stitch and pick up one stitch for each chain along one side of the scarf. You will be picking up one stitch for each 2 knitted rows. Knit back along this row of picked up stitches to create one garter ridge. Bind off loosely. 2) As above, pick up and knit stitches along the other side, using cc. Knit back the picked up row to form one garter ridge of cc. Attach MC and knit 4 rows in garter stitch. 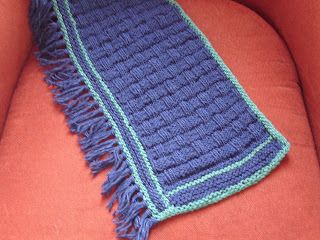 Re-attach cc and knit 2 rows in garter stitch. Bind off all stitches loosely. 4) Fringe: cut 4 17 cm strands of yarn for each fringe. 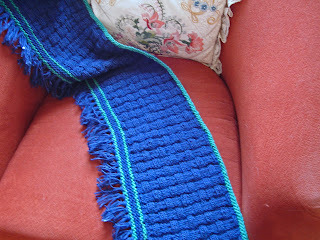 Attach along the long side of the scarf that has the wider garter stitch edging (see photo). Trim fringe to 2 inches. That's it! Let me know if anything is unclear. And please let me know if you knit this. I would love to see pictures. I think it would look good in red with white trim for Valentine's Day. The scarf is beautiful. The pattern is unique and will make a wonderful special gift. Thanks for sharing.